Tim's Mobile RV Repair offers a wide variety of RV services and we think it is a good idea for our clients to be able to see some of the work and projects that we do. This shows some of our works in progress. If you have questions about any phases of our services please E-Mail or call us with any inquiries. Photos above were taken during the installation of a roof air conditioner. 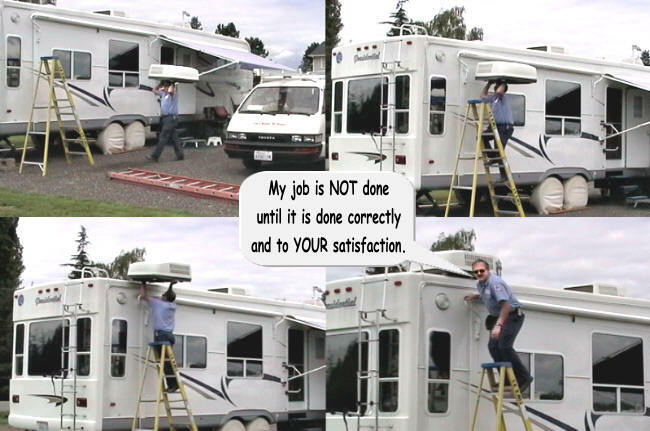 We come to your home or business to service your RV so you can be confident that the work is being done correctly. We start work the minute we arrive at your location so you don't have to worry that the job will "take forever" because your RV just got "parked back behind the shop" for several days until someone got time to work on it. Our customers often tell us that they are so impressed with our MOBILE RV SERVICE that they will NEVER have it done any other way again!